This entry was posted in 2013 Corel Painter Posts and tagged Corel Painter 12 Tutorial Video, Set up for Wacom Intuos 5 Touch, Wacom Intuos 5 Touch. Bookmark the permalink. Thank you for the tutorials, Skip! I’m still using my 8 year old Wacom Intuos 3 and if I ever get any spare money that I don’t need, I’ll use it for a new 5. But by that time we have version 6, 7 or 8! I still have my Intuos 3, too. It was my first tablet. I don’t use it now, but who knows, I might. The oldest computer I have still functioning could use it. I also have my Intuos 4 connected to my laptop. But, I will tell you, the upgrade to the Intuos 5 was well worth the money. The difference in pressure, between the 3 and the 4 or 5 is worth it. In the 3 you have 1024 levels of pressure and in the 4 or 5 you have 2048 levels of pressure. I know a lot of folks who will wait and wait to upgrade. They would be so happy if they would go on and do it. Money is a good reason not to upgrade. But at some point, it is counterproductive to stay with old technology. I hope you will be able to upgrade, soon. You are very welcome. Thanks for visiting and making a comment. Thank you for a super group of videos, So precise and easy for me to understand and follow. I do have a question, someone told me one time not to add any applications for the Wacom. (ex: Photoshop and Painter) because it can really mess everything up. Is there any truth to this? I thought if it was maybe that was a “bug” they had worked out. I heard something like that…programming for multiple applications isn’t a good thing, but that hasn’t been my experience. I find that programing for different applications is a very powerful feature of the tablets. Oh goodness, I’m sorry Kevin was a bother. I’ll have to stroke his ego a bit when he returns. Glad the videos were helpful. Thanks for continuing to stop by and I really appreciate the comment. A big thank you for these classes..They were all very helpful and I have set mine up almost like yours. I did get a little confused on the next to last (radial menu). I did understand most of it , but I decided to forgo this step (Kevin’s fault), as I am going to focus on the other ones for now.. I have a hard time with the shortcuts and this is going help out a lot! The radial menu is a tough one to demo. It has so many options. I have already changed many of my settings and added more. Remember, be ready to change as you use the Wacom. It is supposed to reflect your work flow. I see why you’re a Corel Painter Master. I’ve learned a lot from your intimate knowledge of the Intous5 and Painter too I will be setting up the I5 for my needs with more ease after viewing these videos. Just a Note: I’m not really liking the TOUCH feature at all and disabled it as well the buttons on the Pen because I can’t keep my fingers or hands from activating them accidentally. Touch seems very sensitive to the touch (No pun intended). So good to hear from you. Hope all is well with you. I’m glad you like the videos. I still like the touch features. I’ve been practicing and it is getting better. You may want to look at the touch options and see if varying them will help with the sensitivity of your touch. I didn’t change mine in the video because I wanted to test the default first. I may need to extend the length of the double tap. thanks. For some unknown reason I always thought that the express keys only allowed just a replacement for a shortcut key. And so I never bothered with them as using the keyboard seemed just as easy. Of course as you showed you could do a “Clear Layer” with “Ctrl-A Backspace” (two separate keystrokes). For my tablet I added “Ctrl-D” after it, not necessary, without it I find that I will make a selection after that and it will be the full document (not explained well but you know what I mean 🙂 ). LOL…I understand. This is another of those mysteries. Usually when I do delete layer contents, the selection is automatically deleted along with the contents. But, lordy, stranger things have happened…LOL. I just saw this comment…I don’t know how I missed it. I was surprised about the double keystroke, too. Like you, I keep pushing buttons and find stuff that works even though it isn’t supposed to do so. LOL. I can’t wait to hear about your new Intuos 5. If you have any trouble, just holler. If you got the touch version, I would recommend that you keep the Enable touch function checked in preferences. I think it will be more to your liking to have more control over those functions. In my videos, I have removed the check from that function, which means that I can a few more functions available through touch. But I am finding it a little hard to get used too. Skip – This has been a great tutorial. I’ve almost got it! But The dynamic Brush Adjustment I’ve set up on Key 7 does not seem to work. Any ideas why? I too had an old Intuos 3 and have just upgraded to 5 – what a wonderful difference this Wacom tablet makes. As I recall the dynamic brush adj. did work before I plugged my new Intuos 5 did work. Now that I’ve set Key 7 to Alt & Control. Alt + Control is the right combination. You did use modifier to add alt + control, right? If you are touching the tablet with the stylus when you activate Dynamic Brush Adjustment (DBA), it will not work. Be sure the stylus isn’t touching the tablet and the cursor turns to a plus, then you can touch the stylus to the tablet and drag to the size you want. Those are the only things that come to mind. Are you setting your tablet up for two different software programs? Maybe the tablet isn’t recognizing one of the different software. Thank you Skip. No luck yet. Also am noticing a great deal of jitteriness with my canvas — it is moving wildly (like my old English Sheepdogs that need to go for a walk) — this happens when I put my pen (and hand) on the Wacom tablet. I am wondering if I am getting some sort of wireless interference. Anyway no luck yet on the dynamic brush adjustment. Have you updated your Wacom Driver to the latest one? I know this has helped others with the jittery stuff. But, this is just a wild guess. Everything is stable now. Thank you. Quick Question – Do you know if I can transfer or use my Painter 12 on two computers. I have just upgraded my old mac book pro to a spiffy IMAC. Thank you Skip, trust all is well. I am doing well…recovering still from some surgery I had in the beginning of Feb, but I should be posting new stuff soon. IF YOU AGREE TO THIS EULA, YOU ARE GRANTED A LIMITED, PERSONAL, WORLDWIDE, ROYALTY-FREE, NON-ASSIGNABLE, NON-SUBLICENSEABLE, NON-TRANSFERABLE AND NON-EXCLUSIVE LICENSE TO USE THE SOFTWARE. YOU ARE PERMITTED TO USE ONE (1) COPY OF THE SOFTWARE FOR YOUR (A) PRIVATE, NON-COMMERCIAL PURPOSES AS A PRIVATE USER, AND/OR (B) COMMERCIAL PURPOSES AS A SERVICE PROVIDER IN A COMMERCIAL BUSINESS (“BUSINESS USER”). THIS SOFTWARE IS LICENSED PER HOUSEHOLD OR PER SINGLE ADDRESS (“ADDRESS”). EXCEPT FOR THE COREL PRODUCTS LISTED BELOW, YOU MAY ONLY DOWNLOAD AND INSTALL THE SOFTWARE ON ONE COMPUTING DEVICE. YOU MAY NOT RE-INSTALL THE SOFTWARE ON A SECOND COMPUTING DEVICE UNLESS THE ORIGINAL COMPUTING DEVICE FAILS, IF AUTHORIZATION CODES ARE REQUIRED YOU MAY NEED TO CONTACT CUSTOMER SERVICE AND REQUEST APPROVAL TO RE-INSTALL THE SOFTWARE ON A NEW COMPUTING DEVICE, AND YOU CERTIFY TO COREL THAT YOU DEINSTALLED THE SOFTWARE FROM THE FAILED COMPUTING DEVICE. PRIVATE AND BUSINESS USERS OF AFTERSHOT, COREL CAPTURE, COREL CONNECT, COREL WEBSITE CREATOR, CORELDRAW, COREL DESIGNER, CORELCAD, COREL OFFICE, COREL PAINTER, COREL PDF FUSION, PAINTSHOP PRO, PAINTSHOP PHOTO PRO, PARADOX, COREL PHOTO-PAINT, PRESENTATIONS, QUATTRO PRO, WINZIP SOFTWARE AND WORDPERFECT THAT HAVE MULTIPLE COMPUTING DEVICES (E.G., STAND-ALONE COMPUTER, LAP-TOP AND MINI/PORTABLE PC), MAY DOWNLOAD AND INSTALL ANY OF THESE SOFTWARE PRODUCTS ON UP TO THREE (3) SYSTEMS IN A SINGLE ADDRESS, HOWEVER IT CAN ONLY BE USED BY YOU ON ONE (1) SYSTEM AT A TIME. IF YOU HAVE PURCHASED MULTIPLE LICENSES FOR THE SOFTWARE, AT ANY TIME YOU MAY HAVE AS MANY COPIES OF THE SOFTWARE IN USE AS YOU HAVE LICENSES. I’m not a lawyer…LOL…but it appears to me that you can have the software installed on 3 computing devises at one address provided that you only use them one at a time. so doable. But my new IMAC doesn’t have a slot for the installation CDs and Painter 12 has now been replaced by Painter X3. Of course, as you can tell I am no wiz kid here (mere 67 yrs. young). Any thoughts? Glad you are recovering well. This is getting more and more fascinating. Wrote to Corel. Got the following response (which I think your readers might find interesting). You have indicated to us that you currently use Painter 12 and have purchased a new iMac. If your new iMac is running Mac OS X 10.9 (Mavericks), then it is important to note that version 12 is unfortunately not compatible, nor has it been updated for Mac OS X 10.9. 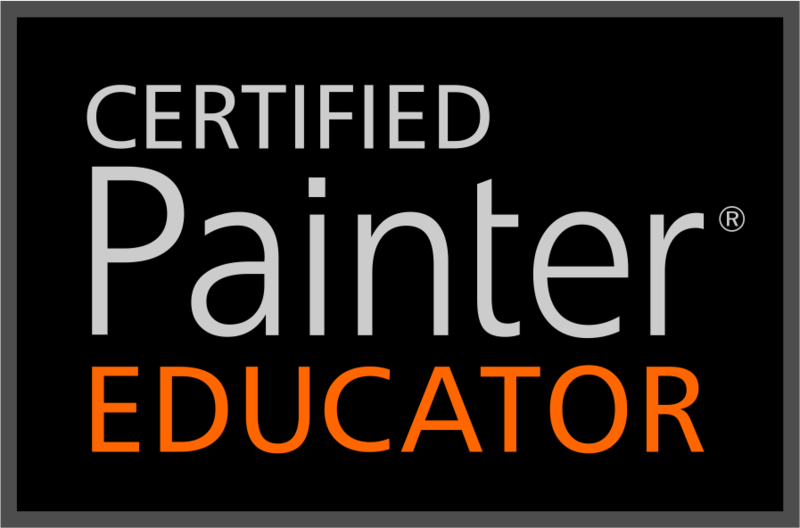 In this instance, it is recommended that you upgrade to Painter X3. Information on Painter X3 can be found at http://www.corel.com/corel/product/index.jsp?pid=prod5090087. You are eligible for upgrade pricing. So my new spiffy mac with OSX10.9 is not compatible and I must upgrade. I am learning and my credit card is being put to good use. I knew that and it slipped my mind. Sorry I didn’t remember it.